Following its U.S. premiere of Brett Dean's String Quartet No. 2, "And once I played Ophelia" at the Santa Fe Chamber Music Festival this past summer, the Orion String Quartet (Daniel Phillips, violin; Todd Phillips, violin; Steven Tenenbom, viola; and Timothy Eddy, cello) performs two concerts with the Chamber Music Society of Lincoln Center. February 6 features violinist Ida Kavafian and flutist Tara Helen O'Connor with a program of works by Mozart, Boccherini, Beethoven and Haydn. The Quartet's sold out, all-Haydn concert on February 26, which is part of Lincoln Center's winter festival Intimate Expressions, will be streamed live on the CMS website. Noted for their European interpretations of Haydn's works, according to The New York Times the quartet "played [String Quartet in C] with energetic brio and graceful poise." 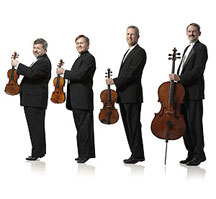 The Orion Quartet's recordings reflect its musical diversity. The ensemble has achieved an enviable reputation for its interpretations of Beethoven's string quartets, and has recorded the complete cycle for KOCH International Classics. Its 2010 Bridge Records release of various Peter Lieberson works featured the premiere recording of the composer's Piano Quintet with Peter Serkin. In addition to the complete Beethoven quartets, the Orion released Leon Kirchner's complete string quartets on Albany Records. Past recordings also include Wynton Marsalis's first classical composition for strings, At the Octoroon Balls (String Quartet No. 1) for Sony Classical, Dvorák's "American" String Quartet and Piano Quintet with Peter Serkin and Mendelssohn's Octet with the Guarneri String Quartet, both on Arabesque. "A noisy standing ovation is nothing rare... but silence can be an even better indicator of a powerful performance. These musicians manage to seduce a rustling, coughing, whispering audience into utterly silent awe." "The group's playing and interpretation was consistently beguiling and technically impeccable. The four extremely virtuosic and accomplished players of the Orion Quartet seem to have been born to be together." The Orion String Quartet and composer Brett Dean join forces again for the U.S. premiere and Festival co-commission of Mr. Dean's String Quartet No. 2, "And once I played Ophelia" with acclaimed soprano Tony Arnold. Through a suite of five short movements, a concise portrait of Shakespeare's troubled and elusive young character, Ophelia, comes to life. This marks the second Festival co-commission for Brett Dean. Praised by The New York Times as a "bold, powerful interpreter," Grammy-nominated soprano Tony Arnold is recognized internationally as a leading proponent of new music in concert and recording. Praised for her sparkling and insightful performances of the most daunting contemporary scores, she returns to the Festival for two performances of Mr. Dean's work. Hailed by the Washington Post for his "poised and imaginative playing," pianist Victor Santiago Asuncion joins Avery Fisher Career Grant recipient and two-time Grammy Award-nominee, flutist Tara Helen O'Connor for Variations on "Trockne Blumen," D. 802 based on Schubert's masterly song cycle Die schöne Mullerin. Orion String Quartet ends the program with Beethoven's triumphant string quartet No. 15 in A Minor, Op. 132 from the composer's late period. The second concert in the Bach Plus series, an all-Handel program, marks the Festival premiere of Grammy Award-winning mezzo-soprano Sasha Cooke. This versatile mezzo joins Timothy Eddy, cello, of Orion String Quartet and Kathleen McIntosh, harpsichord, in Handel's magnificent cantata La Lucrezia (O Numi eterni). The singer, who's performances have been praised by The New York Times as a "luminous standout," recently triumphed in the title role in the world premiere of Mark Adamo's The Gospel of Mary Magdelene at San Francisco Opera. Handel's Flute Sonata in C Major, HWV 365 performed by Tara Helen O'Connor with Kathleen McIntosh, harpsichord. The composer's Piano Suite No. 5, "The Harmonious Blacksmith" performed by Victor Asuncion Santiago completes the program. Since its inaugural festival in 1973, the Santa Fe Chamber Music Festival has become one of the world's preeminent music festivals, guided by a visionary spirit and dedicated to artistic excellence and innovation. Contributing to its magic is the Festival's unique Santa Fe setting, nestled amid the timeless splendors of the Sangre de Cristo Mountains. Under the spirited artistic leadership of composer/pianist Marc Neikrug since 1998, the Festival invites scores of distinguished musicians, along with emerging young talent, to participate in its 6-week season. The Festival encourages communication among composers, musicians, and audiences through premieres of Festival-commissioned works, the programming of works by living composers, and concerts featuring the composer as performer. Since 1980, the Festival has commissioned more than 60 works from such composers as Aaron Copland, Ned Rorem, Ellen Taaffe Zwilich, John Harbison, Gunther Schuller, Mark-Anthony Turnage, Steven Stucky, and Brett Dean, among many others, thereby contributing significantly to contemporary chamber music repertoire. On Sunday, April 27, the Quartet joins a host of friends of the Chamber Music Society of Lincoln Center to take part in a concert pairing selected works by Robert and Clara Schumann. Featuring Schumann's Quartet in A minor, Op. 41, No. 1, this concert brings a number of exceptional guest artists including violinist Ani Kavafian, clarinetist Romie de Guise-Langlois and pianist Inon Barnatan. Violinist Daniel Phillips remarks, "As a teenager, my brother and I began performing for our parents' annual New Year's Eve parties where there was always chamber music until the wee hours. We took delight in discovering the constant surprises in the quartets of Haydn and Mozart and the way in which Haydn wrote with a greater sense of humor than the other, more celebrated Classical-era composers. Of course, after Mozart discovered Haydn's quartets, he took it as a personal challenge to come up to the standard. The minuet movement of Haydn's G minor quartet bears a striking resemblance to the minuet of Mozart's G minor viola quintet, written years later. While playing Mozart's remarkably beautiful and effective early C major quartet, I like to picture Mozart in his teens playing this with his father, perhaps at their New Year's Eve party. The masterful F major quartet measures up very nicely, emulating the equal contribution of the four voices, good sense of humor and perfection of composition that Haydn had well established. Due to the efforts of these two composers, the genre of the string quartet was born." On March 18, New York's WQXR hosted an evening with the Orion String Quartet and dancers from the Bill T. Jones / Arnie Zane Dance Company at the Jerome L. Greene Performance Space. Click here to watch a video performance from the event. The Orion joins the Bill T. Jones/Arnie Zane Dance Company at the Joyce theater March 26th-April 7th for Play and Play: an evening of movement and music - two special programs focusing on the pleasure of musicians and dancers working together.